On Saturday, January 14th, pickleball players headed out early for the Winter In Paradise Pickleball Wing Ding held at Kings Point in Sun City Center, FL. Most of us have been there before, and we keep coming back. It's always a great time, with recreational and competitive play for all skills levels. Louann Dubendorf, of the Kings Point Pickleball League is the planner and organizer of this yearly event that draws people from across the state to play. 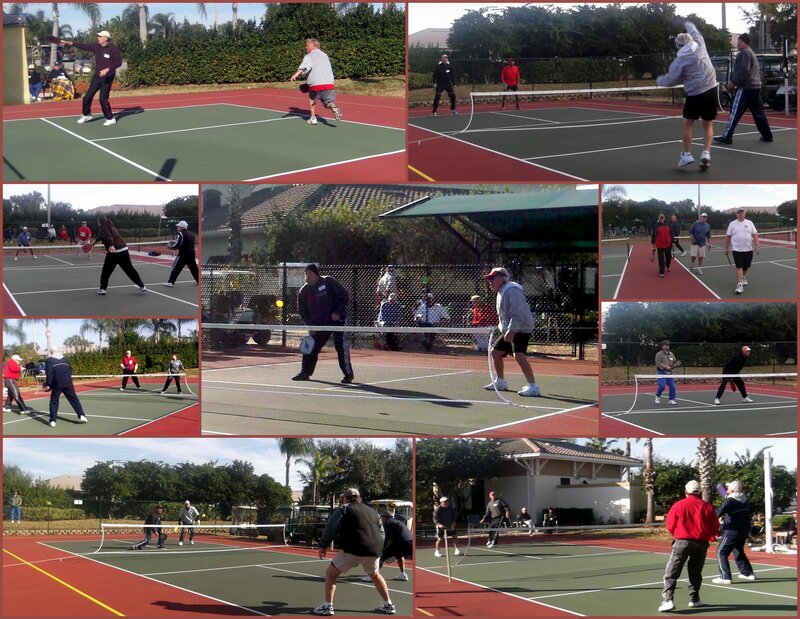 More than 70 pickleball players braved the 40 degree temperatures and blistering winds. USAPA Space Coast Ambassador, Scott Nelson drove three hours again this year to meet up with this year's competition and brought along his son, Joshua. 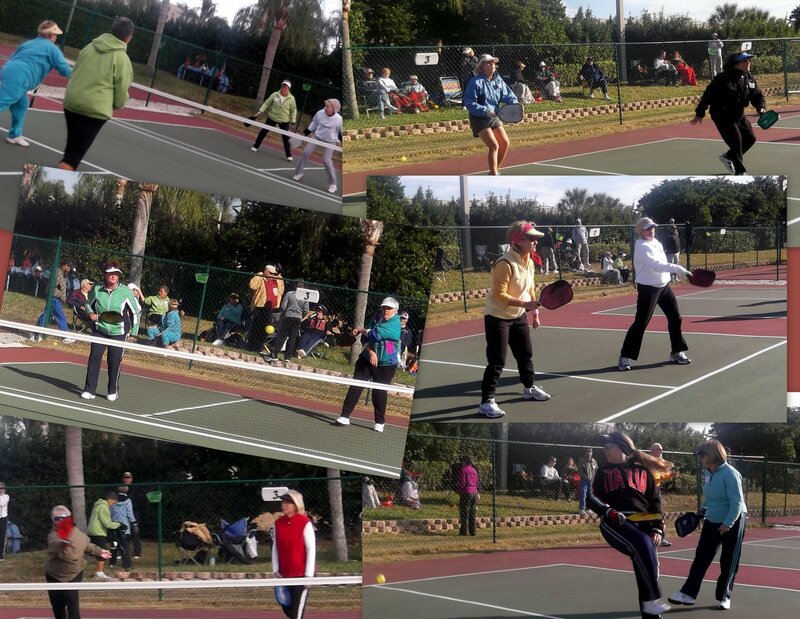 Also taking to the road to meet up with the local competition were groups from the RV Resorts in Wauchuala and Bowling Green, players from the Sarasota/Bradenton and Ft. Myers areas to the south, and from Lutz and Wesley Chapel north of Tampa. Other ambassadors at this event were Ambassadors-at Large Ron and Connie Monson, and Local and Regional Ambassadors Rich and Donna Donald. Everyone arrived bundled for the blast of cold weather that set in over night. First order of business- get your morning goodie bags with breakfast bars, juice, crackers, cookies or candy bars, plenty of coffee and water, and a guaranteed good time. Below players arrive and prepare for the day - passing the awards table and hoping they go home with at least one, checking out their competition and scheduled play, setting up their chairs for the day and then settling in to watch the competition. The competition was set up a little different this year allowing for both recreational and skilled competition. In the men's draw there were two competitive groups and one recreational. The drive from Satellite Beach was worth their while as father/son team Scott and Joshua went home with the gold. Below the men take to the courts. In the mens' recreational group we had players in age from 12 to 80 and both finished with a medal. Congratulations to Art Carpouzis from Wauchula, and 12 year old Zachary from Wesley Chapel. The ladies' draw was set up the same with one recreational and two competitive groups. Below the ladies take to the courts. 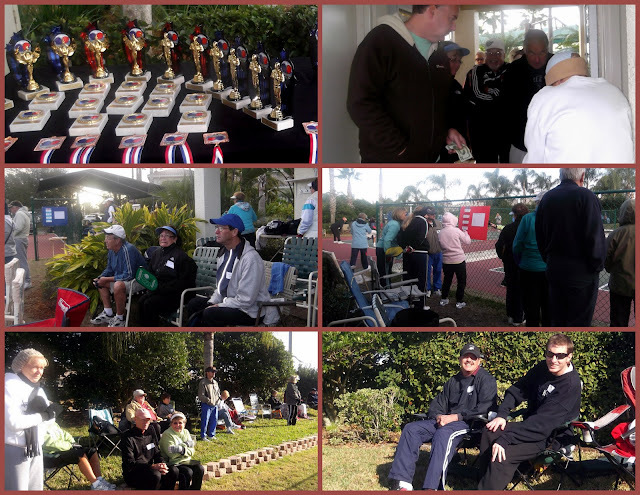 The afternoon was more of the same with the mixed doubles competition﻿. Remember 12 year old Zachary? Well he and his mom Karen finished first in the recreational division. And to make sure that everyone who wanted to play got to play - there was another group set up for anyone who did not have a partner and just wanted to play. And a little more proof that this is a "family" game - another father and son team from Sun City Aaron and Jordan went home with Second Place. The weather could have been a little more accommodating - but the sun did finally shine on a fun filled day of pickleball.